We began reading to Lil Man when he was just a baby. He's always enjoyed reading, and we enjoy reading to him. It's hard to believe that he's starting kindergarten soon. And I know he's going to be reading to us before long! But I had the opportunity to read and review I Love You Just Because (affiliate link) which is the 3rd book in a series. I felt that this book had several messages. The main message of course is I love you just because. In each scenario each bear is loved just because (for their unique qualities). And they don't have to 'earn' their love or do certain things to be loved - they are simply loved for who they are. But another message that I really enjoyed in the book was that each bear was different, and yet it was evident in the book that they were a family. And one of the bears seems to struggle a little with being so different from his siblings. The parents reassured him that he could do things his own way in his own time. And throughout the book there were relevant bible quotes to match the story. I read the book to Lil Man. He looked at the book by himself also :) The book is very colorful with great illustrations. 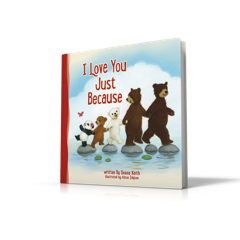 Overall, I found I Love You Just Because to be a fun book with a great message. You can purchase it on Amazon (affiliate link). You can also follow the author and publisher on these social media networks. But I'm also giving away a copy to one of my readers. Simply enter the giveaway tools below.